* FTC Disclosure: Energizer was one of the sponsors for the SVMoms Group Brands and Blogger Mixer I attended. I received a Smart charger and information as a gift and was not compensated or asked to write this post. We go through a lot of batteries in this house. Between all the electronics, the kids toys and the old school camera I am currently borrowing I feel like I am changing batteries in something everyday. The toys alone seem to eat batteries faster then my macky-roni monster eats noodles (I'm sure it's because my kids are always leaving them on!) I have been known to tell the kids that I was out of batteries, or that the store didn't have the right kind just to avoid buying and changing more batteries. For years I have been telling hubs we should get rechargeable ones. He resisted, the cost of set up, buying new batteries and the charger, what size would we get, and the memories of the rechargeable batteries of our youth. You remember those? They took like 3 days to charge and worked for an hour, maybe two? So when I found the Energizer booth at the SVMoms Brands and Bloggers Mixer, I was genuinely interested in what they were talking about. Energizer has a new rechargeable battery/charger system called the Energizer Smart Charger. The Energizer® Recharge Smart™ Charger also features a slow charge rate, which extends the number of life cycles, charges 2 or 4 AA or AAA NiMH rechargeable batteries, and is ENERGY STAR®-certified. It will be available this spring at national retailers for an MSRP of $19.99. Energizer’s latest innovation in battery chargers comes right on the heels of new and improved Energizer® Recharge™ NiMH AA batteries. These 2300 mAh batteries can now be charged up to 250 MORE** times, and will last up to 4X longer* in digital cameras. *vs Energizer® MAX® AA, results vary by device and usage patterns. **vs Energizer® 2450 mAh Rechargeable AA battery. My husband opened the charger up the minute he saw it. He was excited to try it. His exact words were, "Awesome, now my Wii-motes will never be dead again!" When my loaner camera that still runs on 2 AA batteries an hour needed batteries, he bought a few more of the Energizer rechargeable batteries. I have been using them in my camera this week and I have been really impressed. I figured they would last maybe a day. With it being a digital camera (and old one) and the with the flash I thought they would run down fast and cause the camera to be slower than normal. That wasn't the case at all. 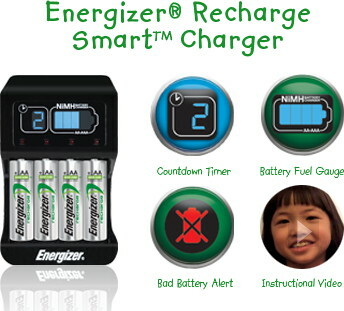 Right now to promote the new Smart Charger Energizer is running a video Contest, Smart Charge and Kids Take Charge. The best thing about this contest? It's all for Charity! Energizer is introducing the new Energizer® Recharge Smart™ Charger by getting consumers involved in a video campaign to drive donations to their favorite charity. The “Kids Take Charge” video campaign asks families across the country to post a video of their child explaining the mischief they can get into when the toys that keep them occupied run out of battery power. The top ten creative entries will receive a portion of the $10,000 donation – based on an online poll – for their charity. Parents can get inspiration from the online ad campaign, also launching today and viewable at www.Energizer.com/SmartCharge, which features kids talking about everything from having tantrums to telling family secrets, each closing with a “Try the Smart Charger….or Else” message. So would you like a Smart Charger of your own? You can buy them at any retail establishment that sells batteries, they retail for $19.99. Energizer will be sending one luck reader their own Smart Charger! To enter all you have to do is leave a comment here telling me what you need the Smart charger for the most, your husbands toys (like my Wii?) Your kids toys, what will you use it for? - Watch the videos in the Kids Take Charge contest. You can see them here or here and tell me your favorite. - "Like" (doesn't have the ring to it that Fan does huh?) the Energizer bunny on Facebook. - You must either include your email address in the comment or have it publicly listed on your profile. This time around if there is no e-mail address, you cannot win! - Up to three entries per person. Giveaway will remain open until Midnight on Thursday May 6, 2010. Winners will be announced on Friday May 7th. Sounds awesome, great giveaway! I'd use this for my little girls toys and for my babu swing, bouncer, etc. Happy Sits Sat! I liked the Energizer Bunny on FB. Very well written review and giveaway, BTW. My boys go through batteries like water. I went out and bought the recharger ones thinking that would help but why did I wake up this morning to a tv remote with NO batteries???? This mamma tried. LOL Hopping over from SITS. I would use this for my digital camera!